The term “rare earths” denotes the group of 17 chemically similar metallic elements, including scandium, yttrium, and the lanthanides (Spedding 1978). The lanthanides are the series of elements with atomic numbers 57 to 71, all of which, except promethium, occur in nature. The rare earth elements, being chemically similar to one another, invariably occur together in the minerals and behave as a single chemical entity. Thus, the discovery of the rare earths themselves occurred over nearly 160 years from 1788 to 1941 (Szabadvary 1988, Weeks 1956). Then followed the problem of separating them from one another for scientific study or industrial use. This has been one of the most challenging tasks of rare earth technology. While the attempts in separating the rare earths began with the work of Mosander during 1839–1841, much of the effort directed to the separation of various rare earths occurred from 1891 to 1940. During this period, from the available mixed and separated compound intermediates many rare earth alloys and metals were prepared and commercial applications were developed for mixed or roughly separated rare earths. The following two decades, 1940–1960, were the most productive in terms of effective process development. Most important were the development of modern separation methods, which resulted in the availability of sufficient quantities of pure individual rare earth compounds (Powell and Spedding 1959) for the investigation of reduction processes to prepare pure metals and alloys (Beaudry and Gschneidner 1978) and evaluation of their properties. Beginning in the 1960s, much progress was made in the large scale production of purer rare earths, in the identification of newer properties, and in their use in a variety of important commercial applications. The usable forms of rare earths encompass naturally occurring oxide mixtures, and products synthesized from them, high purity individual metals, alloys, and compounds. The current annual demand for rare earths is in the range of 80,000 to 100,000 metric tons calculated as rare earth oxides. It has also been estimated (Jackson and Christiansen 1993) that the world rare earth reserves are large and sufficient to support the present level of consumption for many centuries to come. 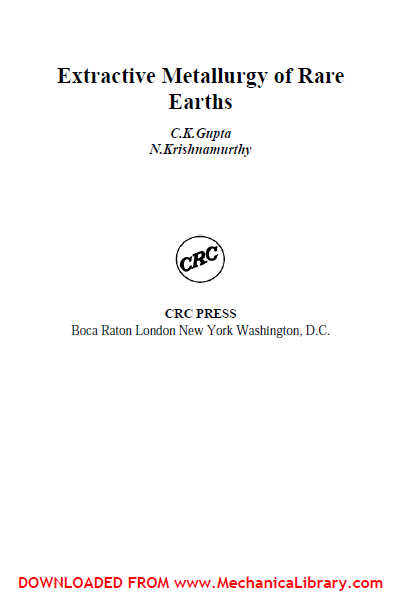 This chapter is a survey of the history, properties, and applications of the rare earths and highlights the background to their current status as materials of interest in the laboratory and products of use in technology and industry. SPECIAL CHARACTERISTICS : The close chemical similarity of all the rare earth elements is, first of all, displayed in their occurring together in nature and further by the fact that it took nearly 160 years of efforts by many great names in science to isolate and identify them. It has been borne out by experimental evidence that striking similarities among the chemical properties of the elements and their compounds is the consequence of strikingly similar electronic configurations. 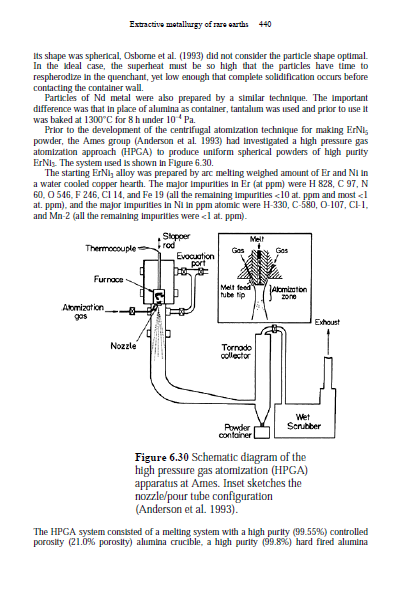 The vapor pressures of all the rare earth metals were systematically determined at Ames in the 1950s using the Knudsen effusion technique for all the rare earth metals except promethium. Their data along with the values for promethium are included in Table 1.2. The boiling points of rare earth metals do not exhibit a systematic variation, even to the extent that the melting points displayed, across the series. Lanthanum metal, which is among the four lowest melting point rare earths, has the highest boiling point. In other words, it has the lowest vapor pressure at its melting point for any rare earth metal. The most volatile rare earth metal is ytterbium. At 1000°C, for example, the vapor pressures of lanthanum and ytterbium differ by more than one billion (Gschneidner and Daane 1988). The heat of vaporization data for the rare earths are also listed in the table. Habermann and Daane (1961) noted certain correlations among the vapor pressure (boiling point), heat of vaporization, and electronic structure of the rare earth metals. For example, the divalent europium and ytterbium in the metallic state have no d electrons, resulting in weaker bonding. Consequently, vapor pressure is higher and the heat of vaporization lower. Later Gschneidner and Daane (1988) considered the electronic states of both the condensed phase and also the final gaseous atom in correlating the electronic structure to boiling point and heat of vaporization. Like the melting point, the boiling point of the rare earth metal also strongly influences the method used for its preparation and purification. For example, the most volatile metals—europium, samarium, and ytterbium—are prepared by the reduction– distillation process, which is very similar to the Pidgeon process used for magnesium (Pidgeon and King 1948). In these and other metals, the high vapor pressures are also exploited for the purification of metal by sublimation or distillation (Beaudry and Gschneidner 1978). On the other hand, relatively high volatility of many of the rare earth metals has been a major limitation in the application of ultrapurification techniques like solid state electrotransport. cerium, praseodymium and neodymium crystallize with one stacking sequence; gadolinium to lutetium crystallize in another; and samarium has yet another arrangement. Most of the rare earth metals undergo allotropic transformation and the high temperature phase just below the melting point is invariably bcc. Europium, which is bcc even at room temperature, undergoes no transformation. Holmium, erbium, thulium, and lutetium also are monomorphic (cph) and do not undergo an allotropic transformation to the bcc phase before melting at atmospheric pressure. However, by application of pressure (~1 GPa), the bcc phase can be transformed in holmium and erbium. As regards the allotropic transformation temperatures, there is apparently no systematic trend across the lanthanide series (Gschneidner and Daane 1988). The allotropic transformation is important in rare earth metal ultrapurification. The electrotransport mobilities of interstitial impurities in rare earth metals depend on the crystal structure of the metal. Mobility is higher in the bcc phase. Thus when no other complication crops up, electrotransport purification is best carried out in the bcc phase. The light rare earths form solid solution with each other, and so do the heavy rare earths. The solid solution is not perfect and the liquidus and solidus lines are curved. When a light rare earth is alloyed with a heavy rare earth, two phases are likely to form. The rare earths are moderately abundant elements in the earth’s crust that occur in a large number of minerals. Rare earths typically occur as carbonates, oxides, phosphates and silicides in the forming minerals. Rare earth minerals are found in hard rock and placer deposits located throughout the world, with unusually large deposits occurring in a few countries. Rare earth minerals in most of the deposits, however, are such that they can be recovered only as co-products or by-products of certain other minerals. In some important deposits, however, the rare earths can be recovered as the primary or main product. Even though there are a large number of rare earth minerals, much of the actual world rare earth supply comes from only a handful of sources. About a dozen more rare earth minerals also occur in deposits that can be used to supplement easily the rare earth supply. The total rare earths contained in world rare earth reserves is considered sufficient to meet the foreseeable demand for these elements, through the twenty-first century. While the total rare earth content in world rare earth resources is large, the availability of individual rare earth elements has for long remained highly unequal. This situation is the culmination of many factors, both inherent and transient. The inherent factor is that while each of the rare earth minerals generally contains all the rare earth elements, the concentrations of individual rare earths in the mineral are, as a rule, highly unequal. In each mineral some rare earth elements are present in high concentrations while some others are in very low concentrations, and this, in turn, varies from mineral to mineral. Besides, there is a wide variation in the contents of different minerals in the rare earth deposits. The predominant mineral in world rare earth deposits is enriched with respect to rare earths of lower atomic numbers and highly depleted with respect to rare earths of higher atomic numbers. The next most important mineral is also similarly disposed, but to a lesser extent. As a result, the rare earths of lower atomic numbers are available more than the rare earths of higher atomic numbers. The transient factor relates to the byproduct status of the rare earth minerals and the occurrence of the element thorium in some of them. These factors affect the current production of the minerals and hence the availability of individual rare earth elements present in them. In the extractive flowsheet of a metal, the term “resource processing” usually refers to the group of unit operations, involving both physical and chemical processing, which convert the as-mined ore to a compound that is either an end product by itself or an inter-process intermediate for the subsequent production of the metal or alloy or another compound. The processes, in the majority of the cases, are directed to the removal of impurity compounds from the material being processed. In the case of rare earths, the resource processing involves not only the operations that result in such impurity removal, but also special operations that achieve the difficult task of separating the considerable number of naturally co-occurring rare earth elements from one another. Rare earth minerals are numerous and even those minerals shortlisted as sources for extraction are more than a dozen in number. However, much of the actual extraction of rare earths is principally from the two minerals monazite and bastnasite. 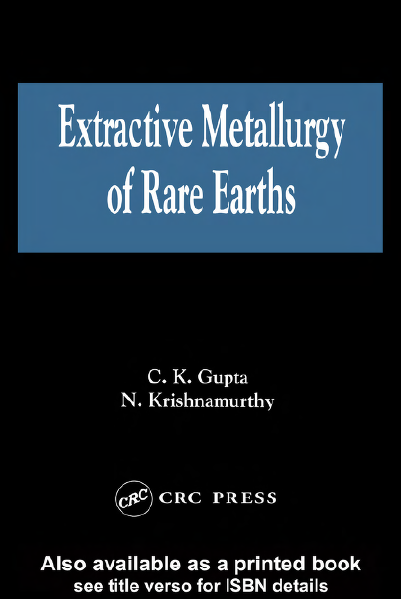 As described in the preceding chapter, all the rare earths generally occur together in all the minerals with large variations in relative proportions. Such occurrence is the culmination of their similar chemical behavior, and it is this chemical similarity that has in the past made separation of rare earths from one another a daunting task. The nature of the occurrence and distribution of the rare earth minerals has generally ensured that they could be recovered only as by-products or co-products. Therefore, except in one important case, Mountain Pass bastnasite, the physical beneficiation of the rare earth mineral is the same as that used for the main product of the resource. The Mountain Pass bastnasite has a unique process for physical beneficiation. Chemical beneficiation or chemical processing of the concentrate obtained after physical beneficiation usually involves hydrometallurgical and sometimes pyrometallurgical operations. That the rare earth minerals will undergo chemical beneficiation by hydrometallurgy techniques is guided by the need for applying hydrometallurgical separation processes for isolating rare earths from one another. The chemical properties of rare earths permit their ready dissolution and easy precipitation. Subtle and systematic differences in the basicity of the rare earth elements have been used in developing possibilities for their chemical separation. The sheer number of rare earth elements that occur together ensured that the separation procedures, if feasible, would be laborious. However, the exhibition of stable multi valence in the most abundant and also in one of the least abundant rare earths simplified to some extent the separation procedures. With the development of techniques like ion exchange and solvent extraction it became possible to work upon the inherent differences in rare earths chemical behavior, however small they are, to effect their separation from one another. reduction. These oxides are extremely stable and their reduction to metal is, therefore, very difficult. The difficulties in reduction are usually compounded but occasionally alleviated by the physical properties such as the melting point and vapor pressure of the rare earth metals. Conversion of the rare earth oxide to a rare earth halide and reduction of the halide to the metal is a useful procedure because of certain inherent characteristics of the halide reduction processes. Fused salt electrolysis as applied to the production of reactive metals also holds relevance for rare earth metals preparation. The relatively low melting point of many of the rare earth metals is an advantage here. The preparation of rare earth metals by a method in which an alloy is prepared first and the metal is then recovered from the alloy is another interesting possibility. In this route both chemical and electrolyte methods of reduction may be used. Every method of rare earth metal preparation has certain advantages and limitations with respect to applicability to individual rare earths, purity of product, yield of the metal, batch size, operational convenience, and economy. In spite of their celebrated chemical similarity in their trivalent states, the rare earths do display considerable variation in properties like melting point and vapor pressure. This variation largely comes in the way of applying certain reduction methods uniformly for the preparation of all the rare earth metals. Another factor is the possibility of a stable divalency in some of the rare earth elements. This frustrates attempts to produce them by the usual chemical or electrolytic reduction processes. Special processes, however, circumvent the limitation. As-reduced rare earth metals, whether produced metallothermically or by fused salt electrowinning, are generally 98 to 99% pure. It is usually possible in certain cases, if care is taken to use pure raw materials and adopt controlled environment processing, to restrict the total impurities in the as-reduced metals to about 0.5%. More often than not this additional gain in purity is either not technically possible or involves a great increase in process cost, especially in commercial scale operations. The general alternative to improving or modifying the reduction technique itself is first to prepare even a relatively impure metal by a commercially viable reduction method and follow it by a suitable refining procedure. This is important because fairly good grade rare earth metals with purity adequate for many application requirements are usually available at reasonable prices, and the metal that qualifies as ultrapure for one application could be impure for another application. This also highlights the need for customizing the refining procedure for a particular application, with commercial metals as source material. The refining step is, therefore, a necessary and important operation in the extractive flowsheet of the rare earth metals. A number of processes are used for refining the as-reduced rare earth metals to different levels of purity. The nature and concentration of the impurity to be removed and the final purity level desired in the refined metal generally govern the refining technique that should be used. In the case of rare earth metals, the applicable processes are strongly influenced by the melting points of the metals and their vapor pressure at the melting point. 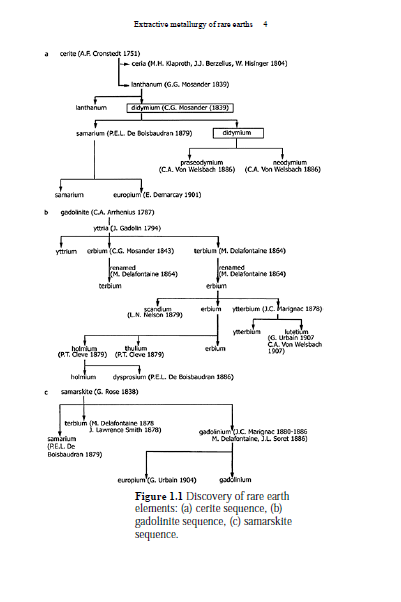 This influence is clearly brought out in Figure 5.1 which depicts the generalized sequence of processes for purification of rare earth metals (Gupta and Krishnamurthy 1992). Complete purification is not achieved by any one refining technique and, as a rule, a sequence of processes has to be applied to remove all the impurities (Jones et al. 1982). The usefulness of a given technique in the near complete removal of one or more impurities from rare earths is a necessary but not a sufficient criterion for its adoption for large scale or commercial operations. The technique has to be compatible with other demands such as product form, metal yield, batch size, operational simplicity, and economics. On the other hand, in the choice of a technique for small volume metal refining for research purposes, major emphasis is placed on the ultimate purity achievable and considerations such as yield and economics become secondary. Rare earths-containing end product materials for commercial use or for research applications are numerous. A complete description of the most important of these materials was given in the section on applications of rare earths in Chapter 1. These materials can be basically divided into two groups. One group comprises commercially used rare earth compounds, alloys, and metals, while the other group comprises rare earth-bearing products obtained using rare earth compounds, alloys, and metals as the interprocess intermediates. 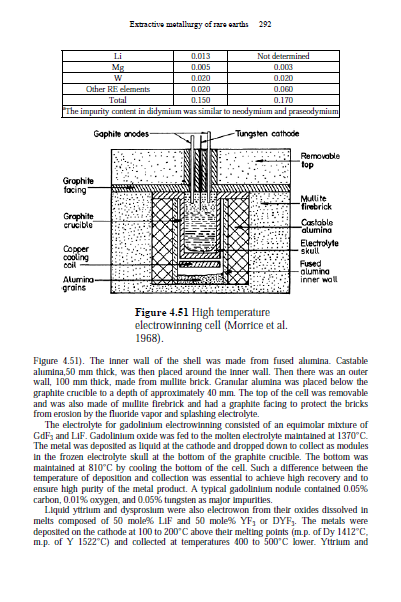 This chapter focuses on the preparation of the commercially used rare earth compounds, alloys, and metals. Several materials, for example, rare earth compounds such as the chloride, hydroxide, fluoride, oxide, and carbonates, figure as intermediates obtained during routine processing or by processes readily branched from the regular flowsheet. 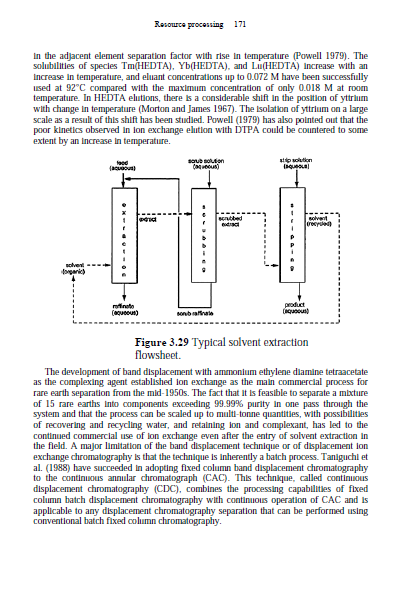 The preparation of these compounds was therefore included in the chapter on resource processing. 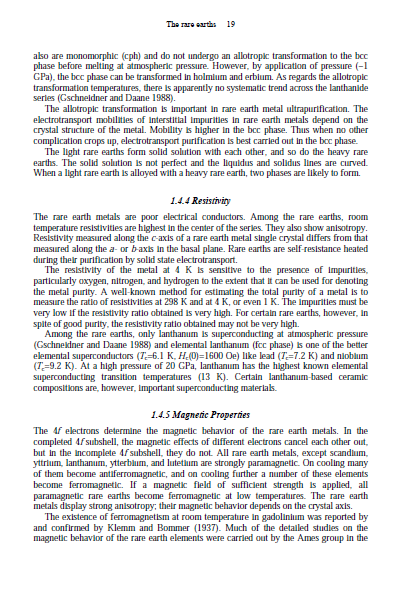 Preparation of elemental rare earths was covered in the preceding two chapters, which also included certain references to the preparation of rare earth alloys either because the processes used were very similar or because the alloys happened to be intermediates for the preparation of pure metals. The materials covered in this chapter are specific specialty alloys of rare earths, starting from misch metal and including rare earth-iron-silicon alloys, yttrium–aluminum alloys, lanthanum-nickel alloys, permanent magnet materials based on samarium and on neodymium, and magnetostrictive, and magnetocaloric materials. Many rare earth compounds have emerged as special performance materials in a range of new technology areas. Their preparative aspects have also been described.